Fuel service is available providing both diesel and gas at market rates. All vessels, please call ahead to arrange service when possible. Schooner Bay’s harbour accommodates vessels up to 80 ft. with an 8 ft. draw at MLW. There are slips available for owners and transient use. 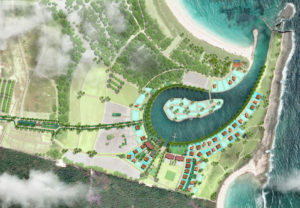 Visitors are welcomed by land as well as sea to our non-gated village community. Full-service facilities are provided for marina guests including 30 and 50 amp electrical service. Internet Wi-Fi, restrooms and showers are also available. Provisions are available through the General Store for ice, marine supplies, snacks and laundry delivery service. We are pet friendly and will assist in local transportation needs. Transient dockage is available on a daily, weekly and monthly basis. Daily dock rates of $2.00 per ft. are variable by the length of the guest stay. Residents of Schooner Bay enjoy the convenience of covered and secured boat storage within the community. This unique opportunity allows our part-time residents to enjoy the accessibility of their private vessel and have peace of mind when they are off-island knowing it will be readily available upon their return.